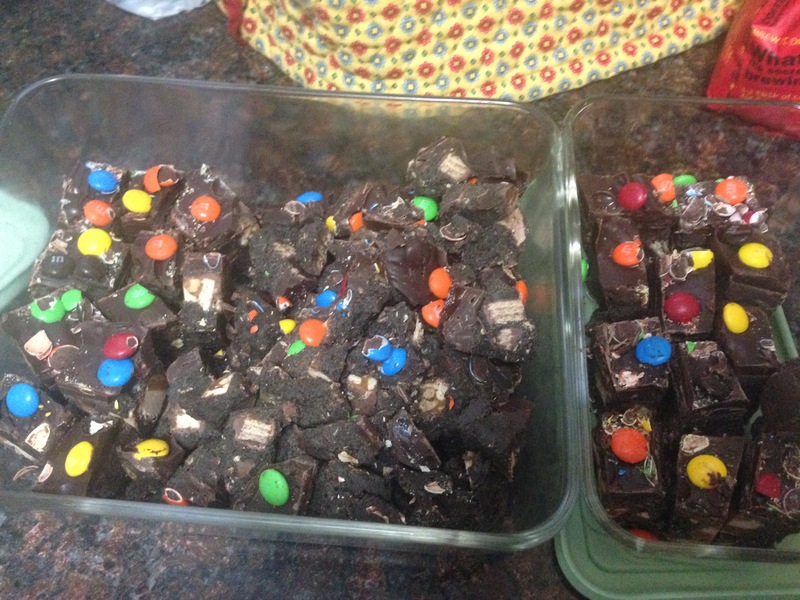 All of these “use up candy” recipes start with a false premise, namely, leftover Halloween candy is something that you need to do something with. Like something other than just put it in your face or give it away. I mean, it’s a fun idea, but these are difficult recipes to justify. 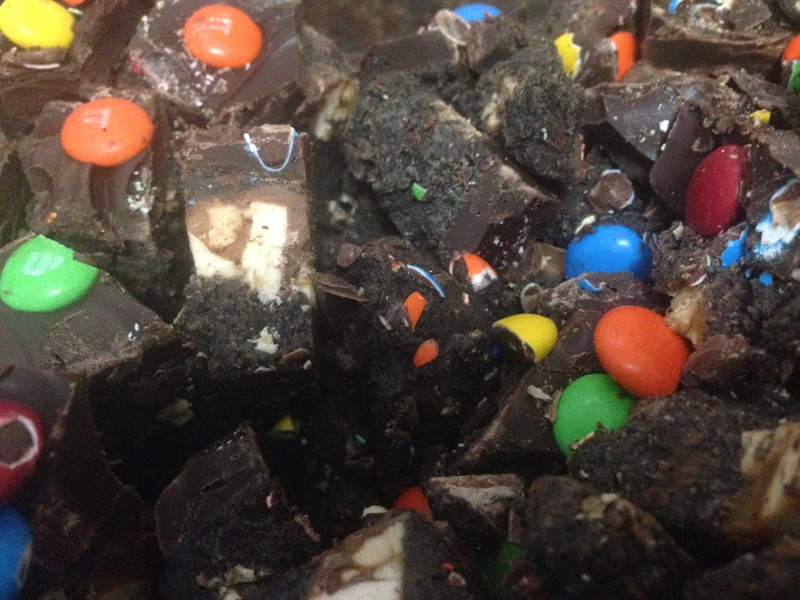 Also, this recipe specifically calls for Kit Kat, Snickers, and Crunch. What if you gave away something else? I actually wound up buying Halloween candy so that I could have these particular leftovers. That’s kind of the tail wagging the dog, right? All musing aside, these are amazing. They are actually worth buying the stuff for. They are rich and sweet and delicious. They are a little like muddy buddies and oreos and a bowl of candy had a baby. If that sounds good, then welcome aboard. 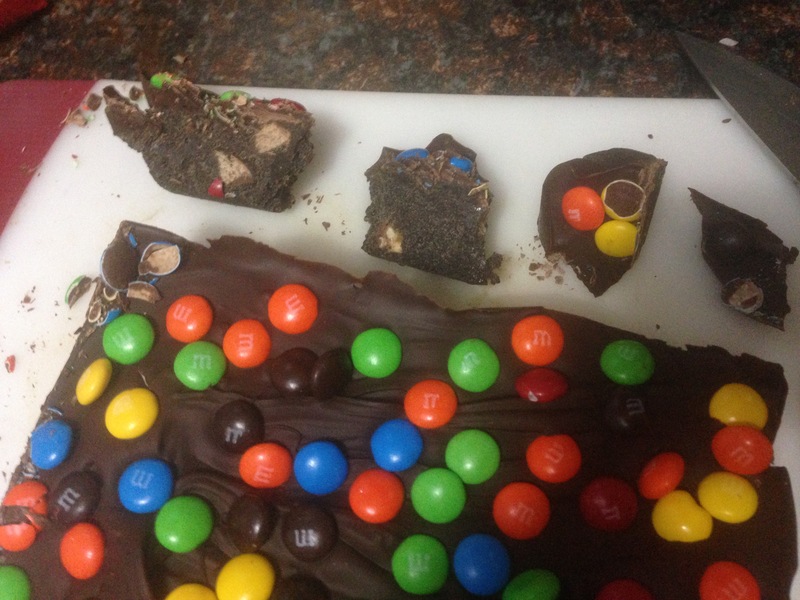 Um, and there were parchment paper pieces in it…that wound up in my sister’s mouth. oops. I brought the pretty pieces (the ones that kind of stayed together) to my family’s party. The rest of it hung out in my fridge. And was eaten by me. Pretty? No. Delicious? My word, yes. So save yourself the heartache and follow the directions on this one. Bravo. That’s the worst picture on the entire blog. Possibly the entire internet. First of all, let me apologize for possibly the worst picture on the internet. A 90’s GIF of stars twinkling would have been better. I’m guessing I need the paid version of WordPress to insert a GIF, so we aren’t going to find out which is worse. 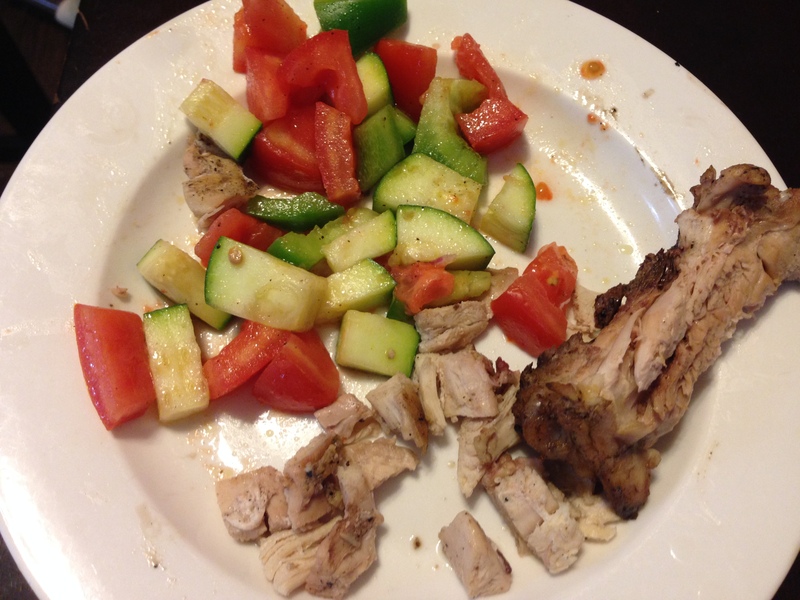 So I apologize for this crime scene photo of a half eaten piece of chicken and some scattered salad. Second, the chicken is fine. 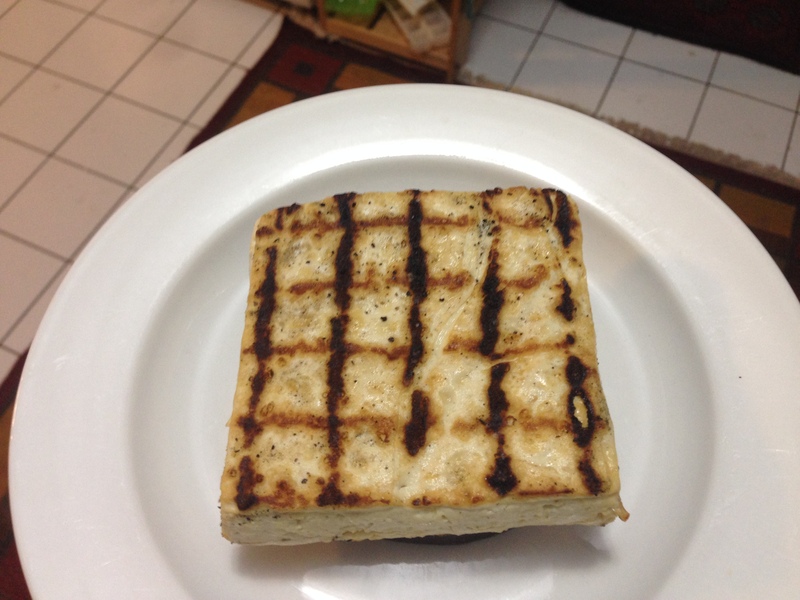 It’s grilled chicken with a marinade. 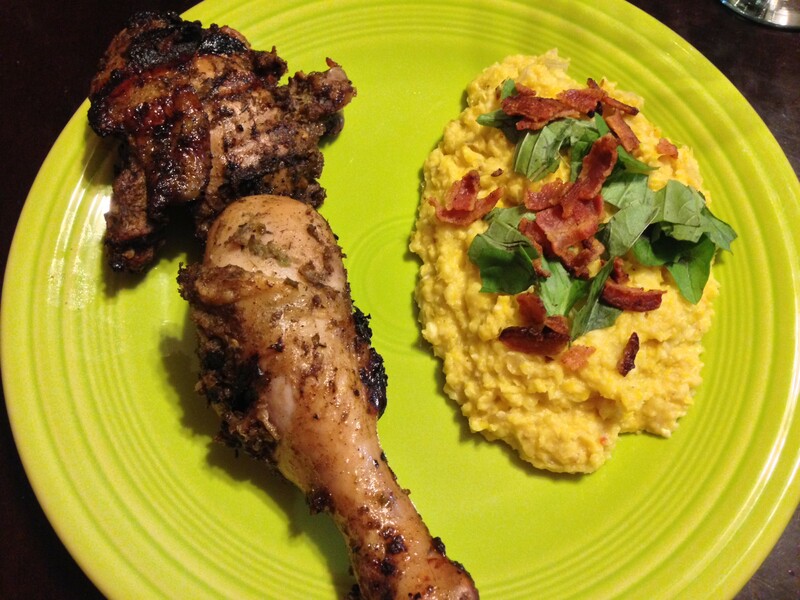 We made it with bone-in, skin-on thighs and adjusted the cooking time. That was fine too. Third, and here’s where I really have something to say, the salsa needed beans. Let me back up. Do you know what Texas Caviar is? It’s that salad with the black eyed peas, tomatoes, jalapenos, bell peppers, etc and a basic vinegarette. You’ve seen it at cookouts. I promise. It’s usually served with tortilla chips. It’s amazing. I had a hard time eating this salsa because it’s just beans and jalapenos away from being Texas Caviar. That and the total lack of tortilla chips. Always a problem. So while this was tasty, the constant reminder of something tastier ruined it for me. By the way, there’s an awesome Texas Caviar recipe in Martha’s American Food. Ah, yet another 50 state cookbook that I own that could be used for some kind of dinner party theme, but is not. Sigh. Upshot: make some Texas Caviar and recommend some photography lessons. 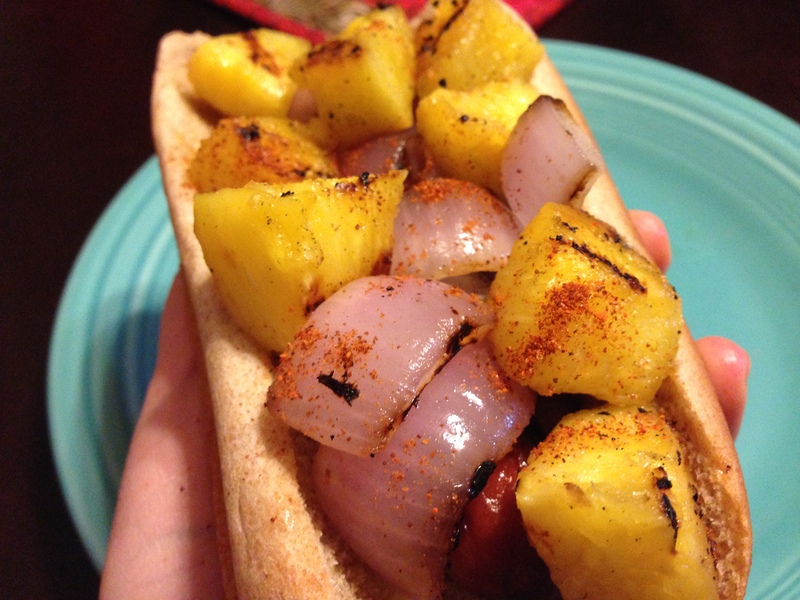 So here’s a hot dog that’s so perfect for me that I’m genuinely surprised I’m not the one who came up with it. I love pineapple. I love red onion. I love hot dogs. Really, this one is hitting all of the high notes. It’s also similar to a hot dog I had at my favorite hot dog place in Chicago, Chubby Weiners. That restaurant holds the ignominious distinction of being where D and I had dinner on every presidential election day since we moved to the neighborhood. Yeah, that’s only two elections. And I think we maybe decided to go there on a non-election day once. But still. To me, this is the Election Day headquarters for our family. Some of you who are familiar with the Chicago hot dog scene (and didn’t chuckle at that last phrase) will wonder why I didn’t pick Hot Doug’s. Well, because my favorite hot dog place can’t be somewhere where I have to wait in line for an hour. It just can’t. And Hot Doug’s is closing, so I have to pick something else. Why not Weiner’s Circle? Because I’ve never been, and I don’t like confrontation. I do, however, love this Conan O’Brien sketch where Triumph the Insult Comic Dog and Jack MacBrayer go to Wiener’s Circle. Well, now I have to try not to fall down a You Tube rabbit hole of Triumph videos. Did you guys know he visited The Real Housewives of Atlanta? It’s really hard not to click that. 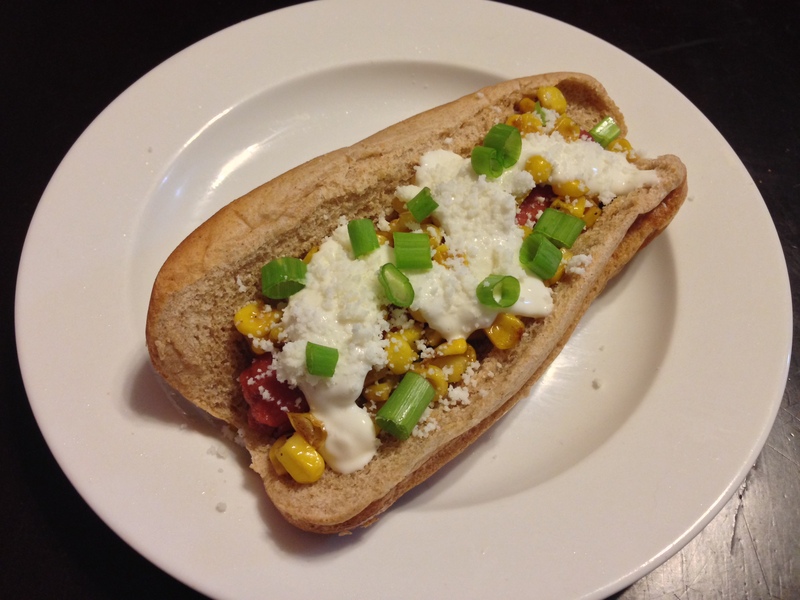 Why am I spending all this time talking about local hot dogs instead of writing about the recipe? Because it’s such a no-brainer. It’s just delicious. It’s also the kind of thing that you already know whether you’ll like it without me telling you anything. Do you like pineapple? Welcome aboard. That was quick. 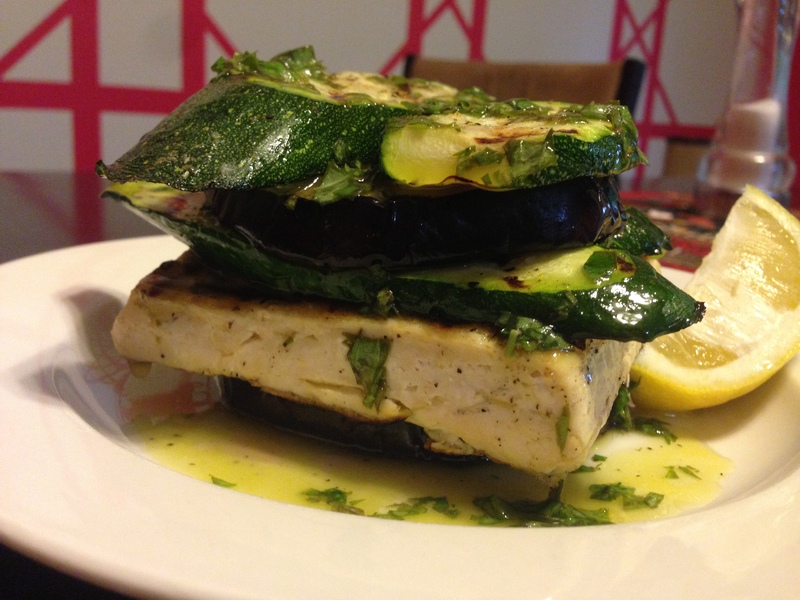 This is yet another recipe where several liberties were taken, but it all ended up for the best. First of all, ground chicken? No. Ground turkey was at Aldi so that is that. Second, foccacia bread? Anything I found was kinda skimpy and flat and didn’t seem like it would make much of a burger bun. So I bought pretzel buns. No regrets. From there, I just followed the recipe. 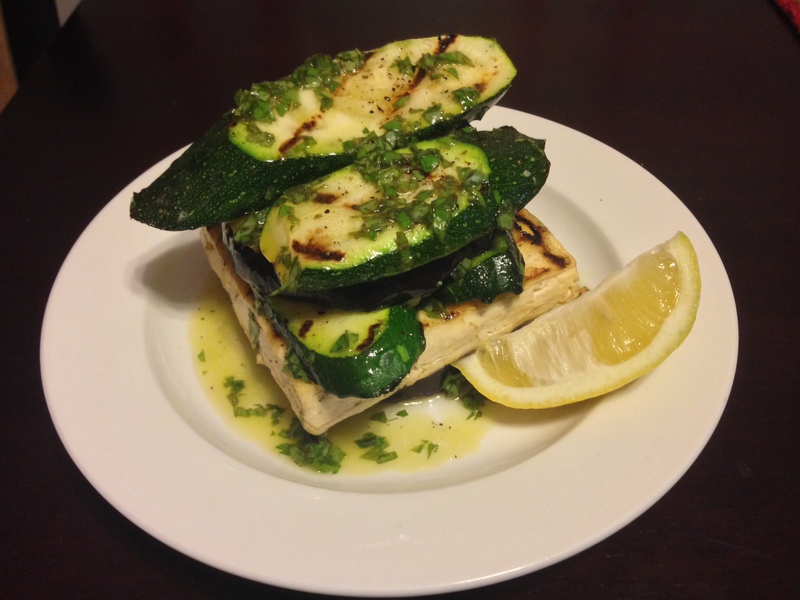 I love that this recipe mixes in some spinach with the basil in the pesto and uses walnuts instead of pine nuts. Anything to make things cheaper, but still taste good, is a good idea by me. 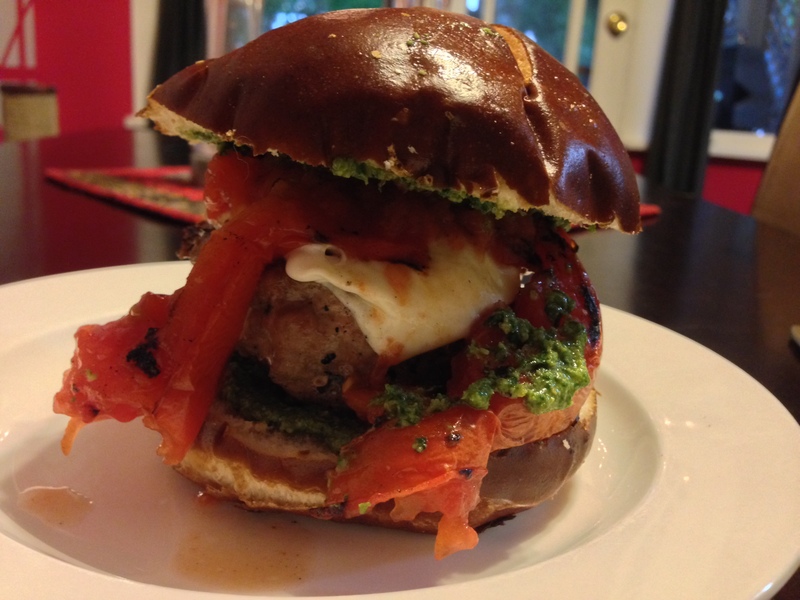 And this is just a tasty burger option. The fresh mozzarella and the grilled tomato were all so squishy and wonderful. The pesto gave it just enough bite. The burger itself was earthy and pleasant. D and I ate it out on our back porch and had a wonderful summer evening. …Yes, that title is a Dumb and Dumber reference. Once again, G dates herself almost to the second. Yes, for two people. oof. 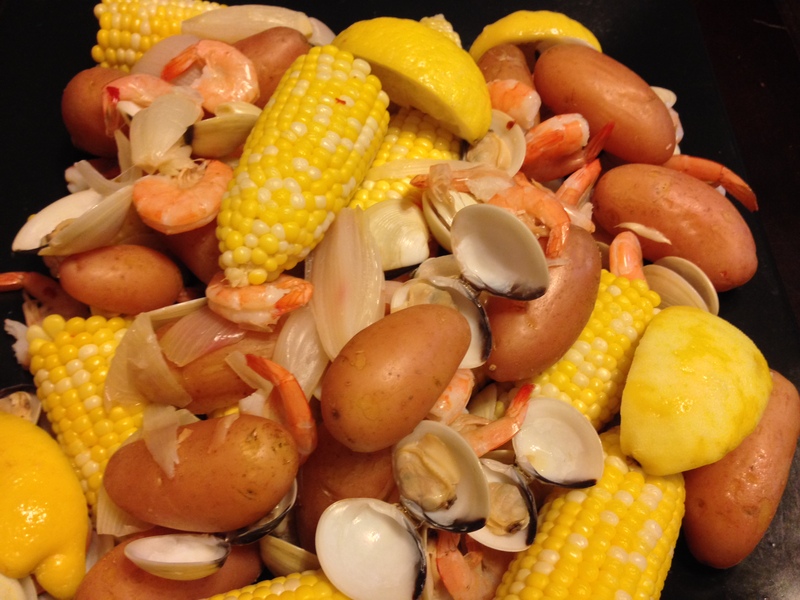 D and I are big fans of another alternative clam bake recipe from Everyday Food. That one you do on the grill. I had never done one of the stove top versions, but I’ve always been intrigued and maybe just a little scared. Why? Well, I don’t have one of those enormous New England lobster boiling, enamel coated, monstrosity pots that these recipes seem to call for. I’ve got the biggest stock pot in the Cusinart set of stainless steel pots and pans that we got for our wedding 10 years ago. So I didn’t want to run into a situation where there isn’t enough room for the shrimp and clams and this becomes a potato and corn bake. I’ve also been reticent because we here in the middle of the country don’t so much have access to clams. I surely didn’t want to buy canned clams (ew!!!!! ), and I wasn’t sure if I could find fresh ones at any of my usual grocery stores. This was not the weekend for a special trip to a fancy grocery store. My fears were, luckily, unfounded. The stock pot was a fine size. And the frozen clams that D found at our normal grocery store (No, not Aldi) were just fine. You were supposed to cook them from frozen, which is great because I didn’t have to thaw clams in the fridge (ew again!!! ), but it did cause a problem for the shrimp. The clams are the second to last thing to go in. The shrimp are last. The recipe has you add the shrimp, turn off the heat, then open the lid back up in three minutes to reveal perfectly cooked shrimp. I opened the lid after maybe six minutes (distracted) and found some 1/8 cooked shrimp. I put them back on the heat and gave them a few minutes to finish cooking. They tasted great. Here’s what I think happened: the recipe assumes that you have fresh clams and I used frozen ones. When I cooked the frozen clams, I brought the clams up to the right temperature, but in doing so managed to bring the temperature of the entire pot way down. So when I added those shrimp to what should have been a warm and steamy environment, it was probably only lukewarm and moderately steamy. Hence, undercooked shrimp (one more time: ew!!!!). So if you’re cooking with anything but fresh clams, keep the pot on the heat for the shrimp step. Oh, the cheesy chive bread? It was ok. I made it garlic bread instead because I couldn’t find chives. 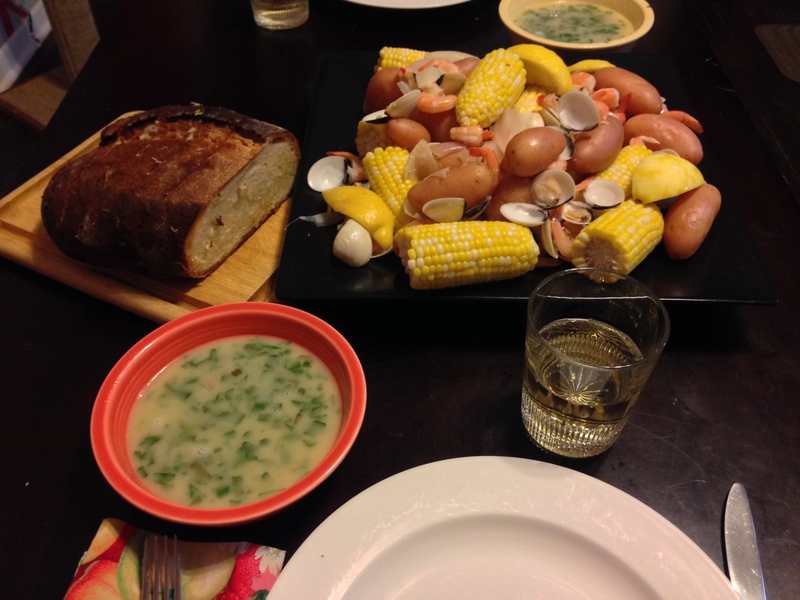 With the corn and the potatoes in the clambake, the bread wasn’t really necessary. It was kind of nice for sopping. I will say that buying a loaf a shade less than crusty is probably the way to go. Hacking through that giant, hard loaf to make the cuts in the loaf was grueling. All that fuss for some garlic bread? C’mon. B also tells me that these clambakes ordinarily have sausage. How this midwestern girl missed out on an opportunity to eat sausage is kind of mind-boggling. As B noted, what we lack in clams, we make up for in sausage. That sounded bad. Never mind. Notice how thick the brownie is? 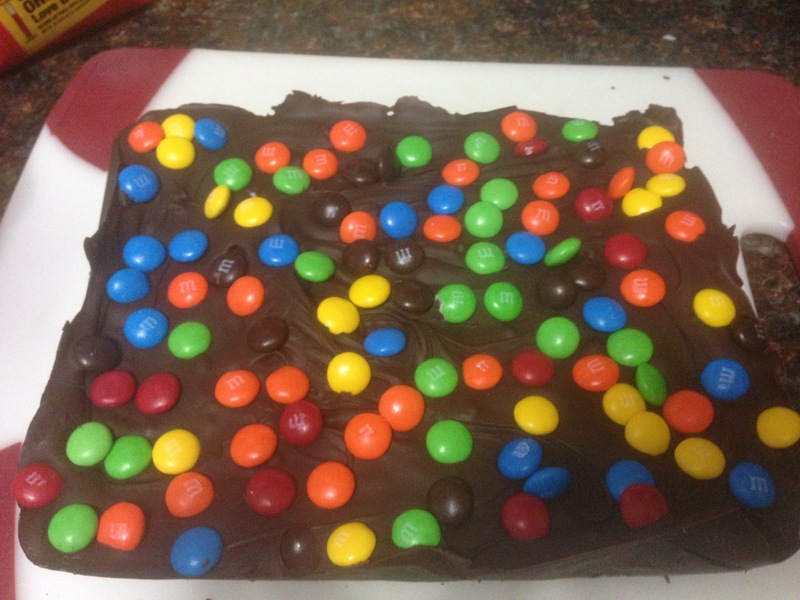 Kind of like an actual brownie, right? Mine was more like a super crispy and thin brownie-flavored cookie, at least on the first day that I ate it. 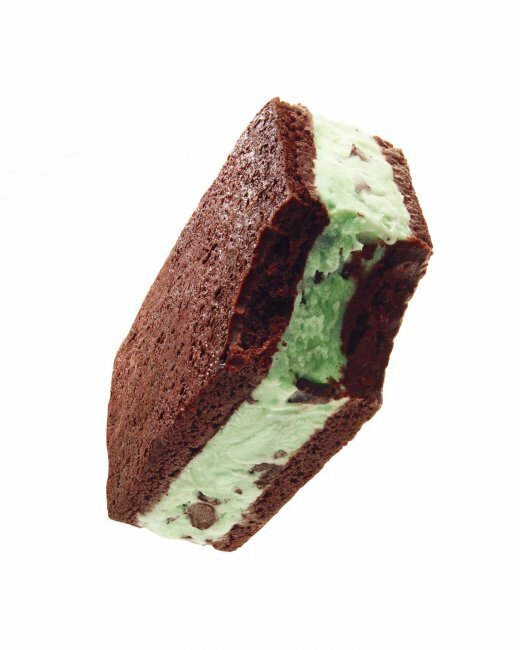 Every day the brownie kept getting softer and softer and the sandwich kept getting better and better. I believe mine wound up thin because I had to get creative with my pan. I only have 18×13 quarter sheet pans/whatever you want to call them. Cookie sheet with the lip on all sides. How’s that? This recipe calls for a 10×15 jelly roll pan. Well, in order to make the surface area smaller, I created a dam of sorts with a glass loaf pan upside down on one side and a sheet of foil bumping up where loaf pan met brownie batter. It was not perfect. The loaf pan wasn’t as long as the sheet pan, so I kinda scooted it back and forth every time I opened the oven to check. 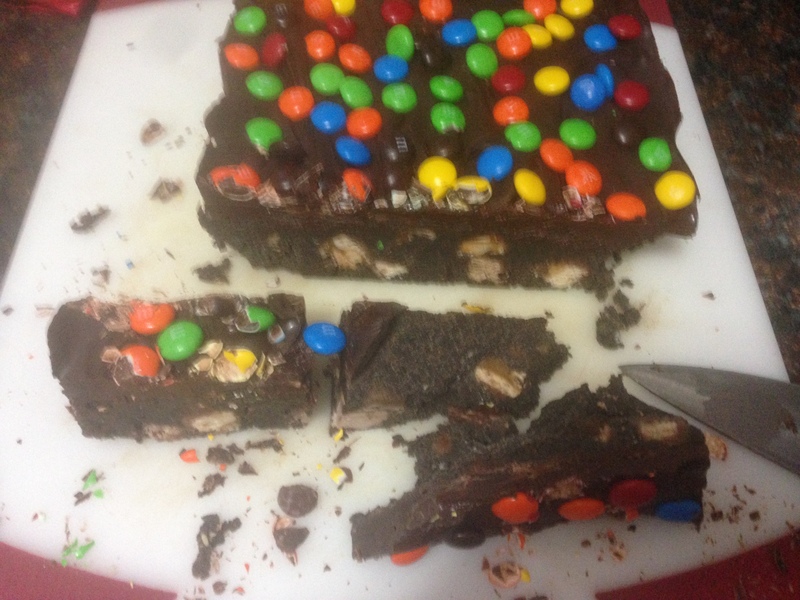 That helped make the brownie a little more rectangular. Anyway, I have no regrets and I will not be rushing out to buy a new pan. The thin brownie was great. So here’s another question that haunts me and D: what other ice cream flavors would be good? Mint chocolate chip was pretty perfect. We were thinking moose tracks, but we don’t want it to get too rich. Cookies and cream, surely. Plain vanilla would probably be nice. Coffee ice cream, maybe? I think anything but plain chocolate (too weird) would be excellent. 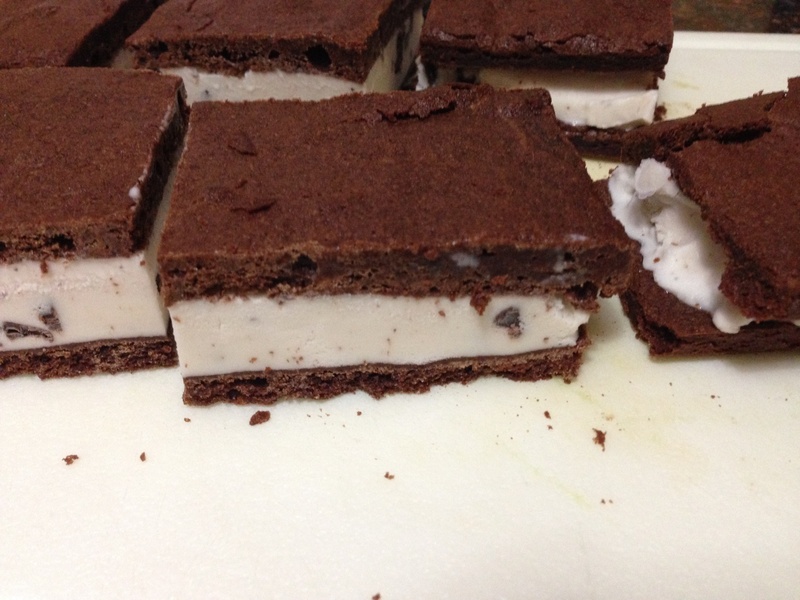 On a related note, these ice cream sandwiches ruled my world for the one week that they were in our freezer. Everything that happened all day long revolved around making it home to have another ice cream sandwich. They are that good. This is from a feature on poaching. 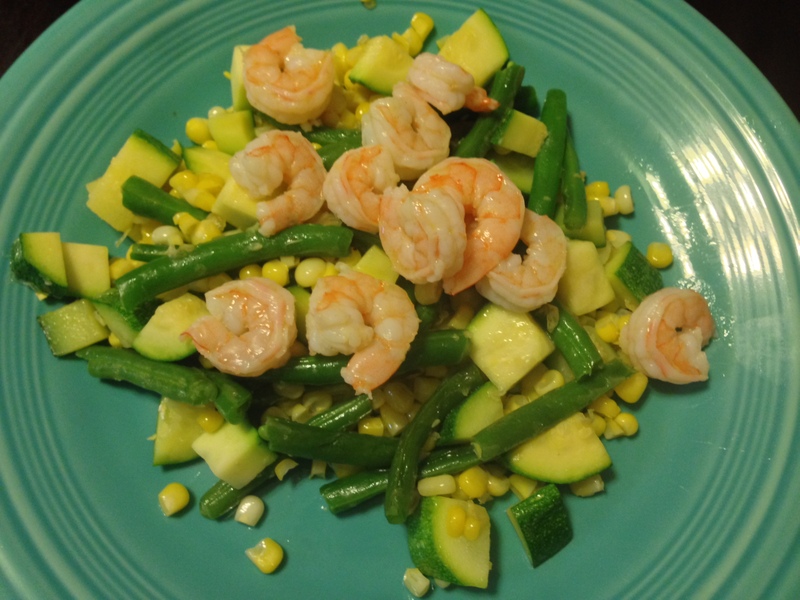 I’m on record as loving poaching as a cooking method, but I’ve never poached shrimp. It never seemed necessary to me. I like to poach chicken because chicken gets dry when you cook it other ways (has anyone ever had dry shrimp? ), needs flavor (shrimp is a flavor), and I hate checking to see if chicken is done or not (shrimp cooks almost instantly). So the draw was not there. It turns out that poached shrimp is amazing. This is poached in water and Old Bay with a halved lemon thrown in there for good measure. My can of Old Bay is almost certainly 10 years old, but this was still good. I should probably buy another can, but let’s be honest with ourselves, I do not cook a lot of seafood, let alone the kind of awesome seafood (read: crabs) that takes a lot of Old Bay. So old Old Bay keeps on rolling along. The succotash is fine. It’s just zucchini, green beans, and corn. It’s almost certainly a waste of corn on the cob to cut it off and cook it like this. Unless the price of corn on the cob is truly great (and it isn’t yet), then frozen corn is going to be a better bet. Really, the shrimp is the star here. I’d recommend poaching the shrimp this way and serving it with some cocktail sauce. I don’t have my secret cocktail sauce recipe in front of me to share with you, so I’ll have to give it from memory… Here it goes: about a 1/2 c. of ketchup, an 1/8 c. prepared horseradish, 1 T or more of hot sauce, 1 t Worcester sauce, maybe a little salt and pepper. 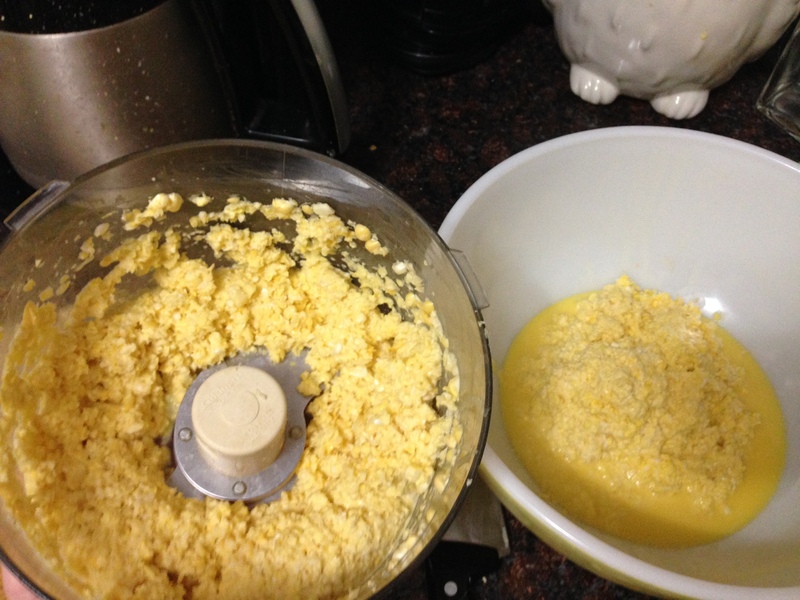 Honestly, I think the recipe might be closer to 1/4 c. horseradish. I add so much horseradish that this is actually pink, not red. If you like hot cocktail sauce, give this a try.